Hossan Ramzy (Arabic: حسام رمزي Ḩsām Rmzy) is an Egyptian merchant seaman. 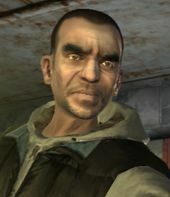 He and Niko Bellic arrived to Liberty City aboard the Platypus. When both of them arrive, he expresses a desire to "make a go of it" and enter the United States to live the American Dream, and tells Niko not to worry about the dumb things he did when he was young. When Niko goes to Algonquin, he meets up with Hossan at Garnet St and Frankfort Ave, Suffolk, where he works as a street vendor selling counterfeit purses and bags, a job for which he was once arrested. He and Niko pursue and kill a man who refused to pay Hossan for his work. After that, Hossan pays Niko some money to thank him and goes back to his work. Hossan's e-mail address is HOSSAN75@grypa.org. Hossan claims in his e-mail that he jumped ship in Florida, despite the fact the Platypus is still docked in East Hook, and stays there for the entire game. "Hossan" is not an Arabic name, and in fact is a Anglicized form of the Arabic first name Hossam. Ramzy is correctly Arabic. An authentic rendering of his name would be Hossam Ramzy. This page was last modified on 26 October 2013, at 18:39.